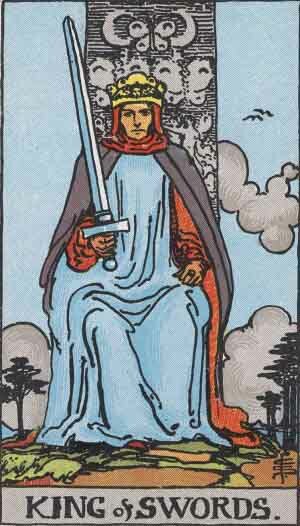 Today’s card is the King of Swords. The King of Swords holds his sword and sits on a stone throne carved with a butterfly motif. He is dressed in a blue robe, while also wearing a black cape with red lining. The King of Swords is bright, perceptive, and completely willing to cut you to shreds if you get in his way. Though the adage is to “speak softly and carry a big stick”, the King of Swords prefers to speak as loudly as possible while hitting anybody who thinks he should be quiet. He’s the kind of person who must be the leader in all situations, who demands attention because he is obviously the most interesting person in the room at all times. Be careful when talking to a King of Swords, because you’ll quickly find yourself getting sucked into his personality vortex.